This high temperature, heat and flame resistant aramid fabric will withstand temperatures of 550°F / 287°C continuous exposure. The base fabric is high strength aramid. The core is available as aramid rope, stainless steel mesh rope or inconel mesh rope. This material is very soft and pliable, making a conformable tadpole that seats well. It is highly flexible and conformable. 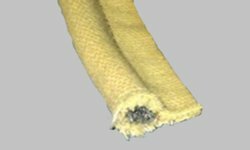 Kevlar® is a popular brand name of an Aramid polyamide material from DuPont. Our Aramid is not a DuPont product. - Tadpole Gasket Bulb diameters: 3/8, 1/2, 5/8, 3/4 and 1". - Tadpole Gasket Standard lengths: 50 and 100 feet.